Baby It’s Cold Outside. It’s Ice Fishin’ Time! The winter solstice has arrived and the long days of winter are here to stay for a while. There are plenty of winter outdoor activities to participate in especially if you love the opportunity to breathe the cold, clean air, spend some time outdoors with family and friends or relax with one’s own thoughts away from all the hustle and bustle of the world. Ice fishing is one of those activities that seem to fill the bill on all of the above. Although it may not appeal to everyone, ice fishing is often preferred over open water fishing. If you consider the lake is frozen, anglers can access just about everywhere on the lake without a boat and virtually every fish that’s available to anglers in the summer can also be caught through the ice – some are even caught more frequently in the winter. Tell someone where you’re going and when you expect to return. Steer clear of dark spots or places where the snow looks discolored. The basics of ice fishing are quite simple. You’ll need something to make a hole in the ice, something to clear the hole and keep it open, your fishing equipment, shelter and apparel. 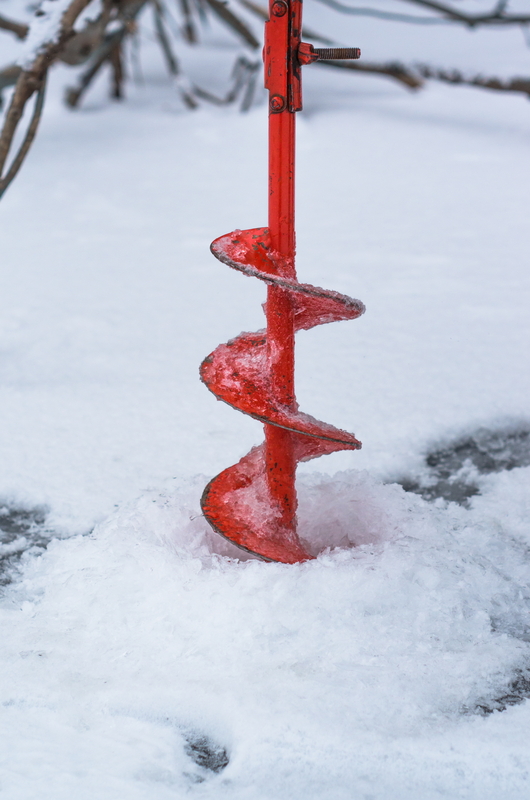 The two basic tools used to make holes in ice are spuds and augers. A spud has a long shank with an end that looks like a chisel and will be used to chip a hole in the ice. A spud is only used when the ice isn’t too thick. An auger resembles a corkscrew with a blade that operates like a hand drill to make a hole. For extremely thick ice, there are power augers that run on batteries or small gas engines that will make your life easier when creating holes in thick ice. A skimmer (or slush scoop) is a long-handled cup with holes in it. A skimmer is used to clear the hole right after it’s made as well as throughout the day if additional ice forms within the hole. Keep in mind the size of the hole is important. It must be big enough to get a fish out but not so large that it may be a danger to someone’s safety. It is recommended to keep the hole to a maximum of 8-10 inches in diameter. Conscientious anglers will mark an abandoned hole with sticks, tree branches or ice chunks to alert others of the hole’s presence on the ice. Although the idea of ice fishing may not appeal to every and seem daunting to others, many fishing clubs and sporting goods stores hold annual ice fishing clinics where anglers can learn the basics. Check your local area to see what is available to get you introduced to this unique sport. Watch for Part 2 in this series which talks about more of the basics of ice fishing – your equipment, shelter, and apparel.